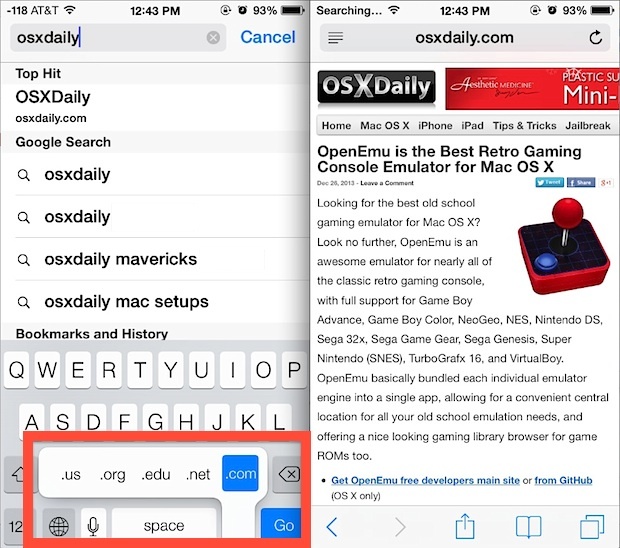 The keyboard in Safari long had a convenient “.com” button, which made going to websites quicker, and if held down revealed more TLD (Top Level Domain) choices, like .net, .org, .edu, and .us. 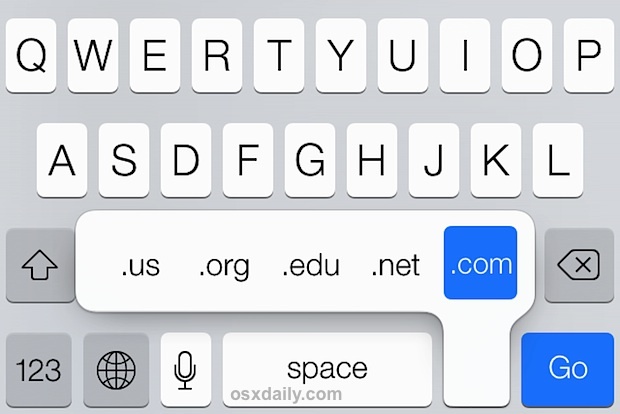 As many have noticed, that “.com” button is missing from iOS 7… at least upon first glance. It turns out there still is a way to easily type top level domains with the latest versions of Safari, it’s just slightly hidden. Simply hovering over a single one of those TLD’s will type it out in full, and you can then tap the “Go” button to jump to the website. If the five default available TLD choices do not include the ones you use frequently, you can use this trick to add additional international TLD’s with a settings adjustment to iOS. It’s worth remembering that you can also sometimes skip the TLD completely to head to a website faster with the Safari app (and Chrome too for that matter), though it doesn’t work for every site out there. This is just one of many major user changes that was brought to Safari with the significant iOS overhaul post-7 release. Heads up to Lifehacker for the reminder about this trick. The shortcut in Safari I use more often is holding down the comma key and sliding up to the apostrophe. That’s awesome man. Never knew that we can access such shortcuts in Apple safari browser too.